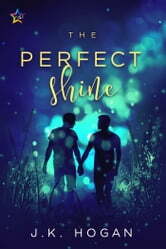 The Perfect Shine is about a lot of things, but I think what stood out most for me, is that it’s about figuring out who you are, and I will always read the hell out of that kind of story This book follows Jackson Meade and his best friend Blake Renault. From the day they first meet in high school, it’s clear that there’s a connection between them despite their differences. Sweet, befuddled, bullied, unusual Jackson in his skinny jeans and band t-shirts is surprised when popular, tattooed, soccer playing Blake seems to want to be friends with him. That’s what this book is all about though, the connections that we make with people who may not be the same as us… the non-judgemental kind of love and friendship we all need. I think this story also reminds us that we shouldn’t be drawing conclusions about who people are, what they think, what kind of life they’re living… based on how they look. Life can be pretty confusing without us all making assumptions about each other. As this lovely friendship blossoms, Blake creates a buffer safe zone around Jackson with his unconditional support and it’s a very new thing for Jackson. He’s the kind of guy who doesn’t much like to touch people, and he’s not really social, preferring his own company. There are things going on in Blake’s life that make his home life untenable and big-hearted Meredith (Jackson’s mom) takes him in. No spoilers here, people! As the two young men grow and change, they find themselves off on different paths even though they are still inexplicably drawn to each other. For one… the attraction is confusing and terrifying, for the other it’s just how he’s always felt. The book is about how they figure that out and what will become of their friendship once they do. I loved this book. I want to cuddle it. Honestly, the relationship between Blake and Jackson made my heart feel all warm and fuzzy. Did you ever want a friend who would kind of just show up, and be … everything? Reading this made me feel good and it made me miss my best friend. Please write more dear author.